Donald Keene became smitten with Japanese literature as a teenager, after he purchased the two-volume set of the English translation of The Tale of Genji for 49 cents. He went on to teach Japanese literature at his alma mater, Columbia University, and to become one of the foremost translators of Japanese literature, introducing the Western world to the works of Basho, Chikamatsu, Abe, and Mishima, among others. Now, at the age of 89, Columbia University Professor Emeritus and Shincho Professor Emeritus of Japanese Literature will move to Japan permanently and seek Japanese citizenship. 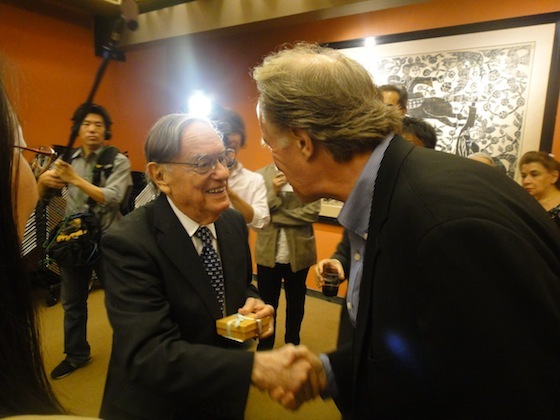 On June 13 the Japan Society honored Donald Keene with a farewell party, Keene’s final appearance in New York before his move. Carol Gluck, George Sansom Professor of History at Columbia University and a former student of Professor Keene’s, hosted the casual chat at which Keene spoke about his love affair with Japanese literature and culture. 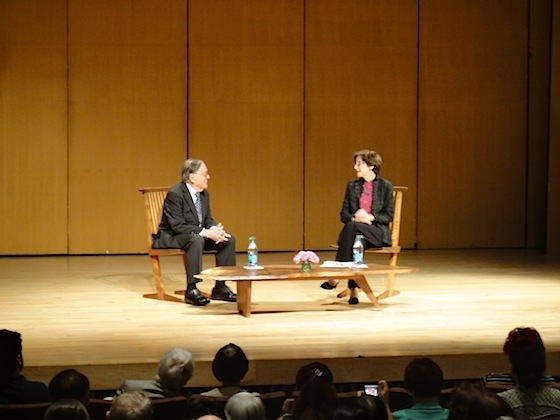 Gluck, a noted and decorated scholar of Japan in her own right, needed only to ask, “How did it start?” and Professor Keene delighted the sold-out auditorium (and a separate room with an overflow crowd watching a camera feed) with his memories of being introduced to Asian culture, learning the Japanese language, and experiencing life in Japan. An engaging and witty storyteller, Professor Keene walked us through his education, saying he learned very little about Asia. “If Japanese history was mentioned . . . it was always in connection to one thing only, and that was Commodore Perry had opened Japan,” Professor Keene says. A turning point in his life came during his first year at Columbia, when he he took a humanities class that was taught by the Pulitzer Prize-winning poet Mark Van Doren. Although the class itself was important to Professor Keene’s education, the alphabetical seating arrangement proved serendipitous to his introduction into Asian culture, for it placed him next to a young Chinese man named Lee. Over daily lunches of egg fu young and fried rice, Professor Keene eventually learned kanji (complex Chinese characters) from Lee. “I was collecting them the way I was collecting postage stamps,” says Professor Keene. This opened the door to a lifetime of Japanese scholarship and was one of a series of seemingly random situations that intensified Professor Keene’s thirst for knowledge of Japan. A chance meeting with a man who taught English in Taiwan – then a Japanese territory – lead to a Japanese study group in North Carolina during the summer of 1941. For most of his senior year of college, he was the only student of Ryusaku Tsunoda, the “father of Japanese studies” at Columbia. After the Japanese bombed Pearl Harbor, Keene enlisted in the Navy, where he studied Japanese at the Navy’s language school in Berkeley, California. He then translated the diaries of Japanese soldiers for the US military. This was his first foray into translating, which would become a key element of his career. Translating the works of major authors of Japanese literature, many of whom became Professor Keene’s friends, led to Professor Keene’s deep appreciation for not only the words of the Japanese, but the culture as well. “I think it’s fair to say that there is no one who knows the culture of Japan in the West with the breadth and depth that Donald Keene does,” says Gluck. While it may seem unusual to those unfamiliar with Professor Keene’s life that he would permanently leave his native country to become a citizen in Japan, he is in many ways a part of Japanese society. Since 1970, Professor Keene has spent eight months of the year in Japan, returning to New York each spring to teach his Japanese literature course at Columbia. The permanent relocation is quite natural to Professor Keene.